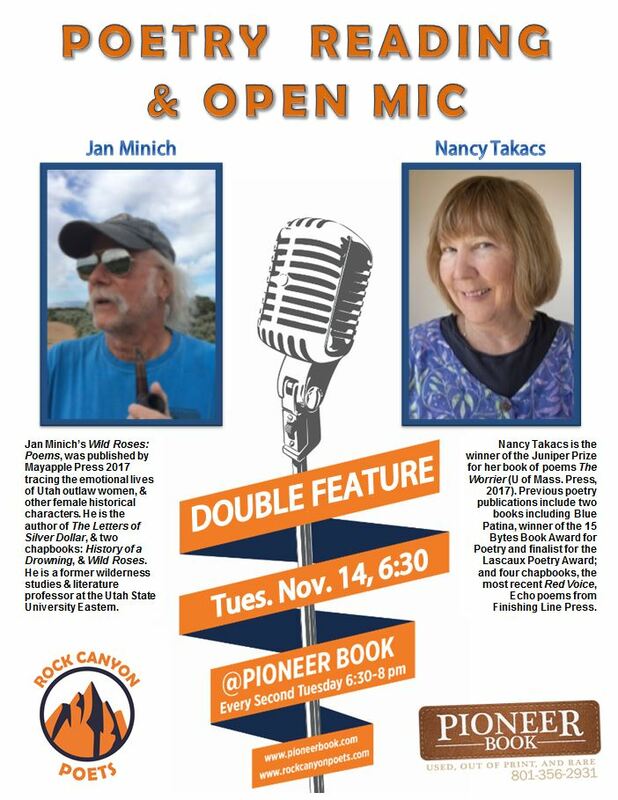 Don’t miss two incredible Utah poets: Nancy Takacs and Jan Minich! Both former professors at Utah State University Eastern. Nancy Takacs is the winner of the Juniper Prize for her book of poems The Worrier (U of Mass. Press, 2017). She was a 2016 runner-up for the Missouri Review Editor’s Prize. Previous poetry publications include two books including Blue Patina, winner of the 15 Bytes Book Award for Poetry and finalist for the Lascaux Poetry Award; and four chapbooks, the most recent Red Voice, Echo poems from Finishing Line Press. Her work has appeared in New Poets of the American West, and in the Harvard Review, Kestrel, Hayden’s Ferry Review, Nimrod, and Weber. She lives with her husband Jan Minich in Wellington, Utah. Jan Minich’s Wild Roses: Poems, was published by Mayapple Press in 2017, tracing the emotional lives of Utah outlaw women, and other female historical characters. He is the author of The Letters of Silver Dollar, and two chapbooks: History of a Drowning, and Wild Roses His poems have appeared most recently in Verse Wisconsin, Sugarhouse Review, Kestrel, Clover, and Weber. He is a former wilderness studies and literature professor at the Utah State University Eastern. Although Utah is home for him, summers he cruises Lake Superior in a small boat. Takacs and Minich visit Provo as guests of the Rock Canyon Poets. The reading is open to the general public. For more information, contact the Rock Canyon Poets, rockcanyonpoets@gmail.com. 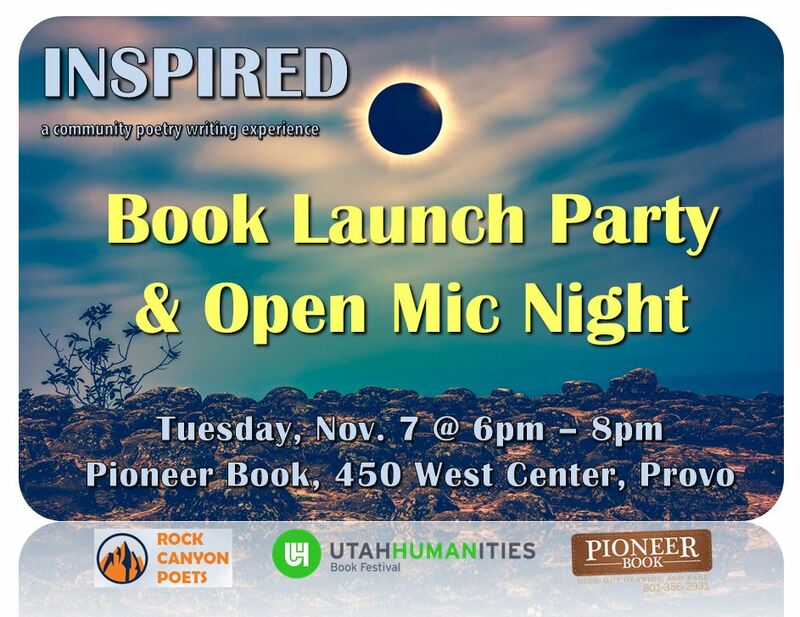 The Rock Canyon Poets and Pioneer Book, in participation with the Utah Humanities Book Festival, announces the release party of “Inspired,” a community poetry writing experience and open mic on Tuesday, November 7, 2017 at 6:00 pm. “Inspired” is a printed anthology of local Utah poets who recently participated in a free community workshop. Each contributing poet receives a free copy and additional copies will be available to the public for $5 at the event. Poets will read their work from the anthology, after which, the open mic will begin and audience members are invited to read a poem they have written or a favorite by another poet. Light refreshments will be served. Rock Canyon Poets and Pioneer Book host poetry open mics the second Tuesday of each month.